As speculation of an increase in United States interest rates by the Federal Reserve continues to strengthen the dollar, a decrease in demand has driven the price of gold to a 5-year low. The price of gold has been falling for nearly 6 consecutive weeks, and reached a Friday low of $1,051.60 per ounce. The plummet of the value of gold is an unusual occurrence given the current instability of world markets. As a general rule, investors concerned about economic volatility turn to gold as a safe commodity to hold through tumultuous times. In this instance, however, the emerging strength of the dollar has brought investor dollars into equities markets even in an uncertain market. The driving force behind this plunge and a general selloff of the euro in favor of the dollar has been speculation over the interest rate hike that is supposed to be coming next month. While it has not occurred yet, the strength of the US dollar is currently sufficient for investors to remain confident, even if the rate hike is delayed once again. Analysts suggest that this is the beginning of a long term downward trend for the price of gold. 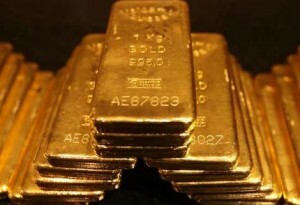 Claude Erb, who has studied the value of gold as an investment for many years, even suggested that it might reach $350, a price that has not been seen in over a decade. Fortunately for those who invest in gold, it is generally thought that the true market value is roughly $825 an ounce, meaning that even if it hits such a low a long term rebound is likely.